As Facebook continues to expand it’s focus to include the business world, they finally have created a way for page owners to protect themselves from page hijackers. One of my basic keys to success in social media is to have a policy. A policy which includes removing all passwords and administrative abilities. But, the new levels of admin helps protect you, the business and page owner. Let’s take a brief look at each of the five levels. Insight Analyst– This is the most limited level and can only view the page insights. 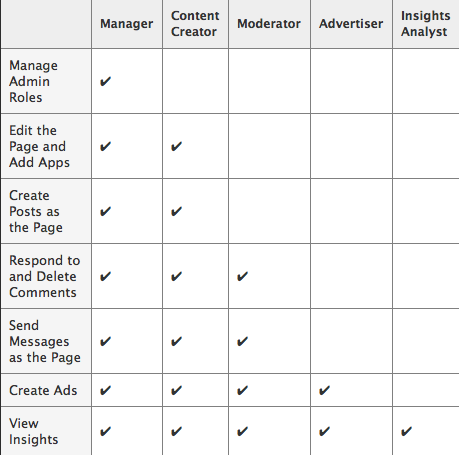 Advertiser– This level can view insights and create ads. Both of the first two are probably most appropriate for third party providers. Moderator– A Moderator has the ability to do the previously mentioned activities and they can add or delete comments on the page. They also have the ability to respond to messages. Content Creator– This admin level can do all the aforementioned functions and they can create posts as the page, edit the page and add apps. Manager– The Manager has full access to the page and they are they only people who can add administrators and set permission levels for said admins. I’m a big supporter of employing what I call a “Social Media Squad” within your organization to fully leverage this incredible tool. However, I strongly recommend you review your Admins and assign the proper level of control each has on your most valuable Page.